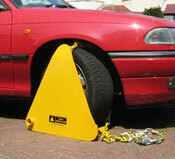 The wheel clamp used by clamping professionals. 1. Rest the triangle plate against the wheel with the chain hole at bottom left and chain loop (the piece of chain with both ends attached to the triangle plate) looped over the right side of the tyre. 2. Pass the unattached chain end around the back of tyre, and over the vehicle’s suspension arm.